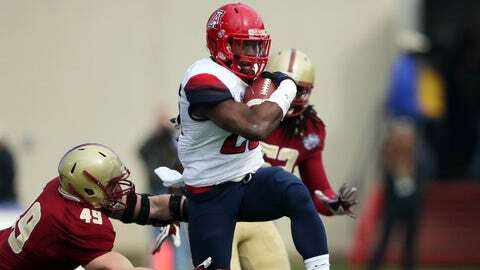 Ka'Deem Carey (above) ran for 165 yards and two touchdowns, while Andre Williams had 75 and a score. Billed as the bowl season’s best running back battle, Arizona’s Ka’Deem Carey — with some help from a dominant defense — turned his clash with Boston College’s Andre Williams it into a one-sided affair as the Wildcats crushed Boston College 42-21 in Shreveport. Here are four observations from the AdvoCare V100 Bowl. Earlier this month, Carey joined Williams in Orlando for the College Football Awards Show, where the Wildcats RB had to watch the Eagles star hoist the Doak Walker. Carey also had to sit at home while Williams made a trip late that week to New York for the Hesiman Trophy ceremony. But the Arizona junior got the best of his fellow first-team All-American on the field, extending his FBS-high streak of 100-yard games to 16 straight with 165 and two touchdowns on 28 carries. Meanwhile, Williams had 75 yards and a score on 26 attempts, his second straight game below the century mark. The sheer magnitude of what Williams did in running for 2,102 yards in the regular season — the ninth-highest total in history — was too much to ignore. He also had a marquee performance with 149 yards against top-ranked Florida State. But when you consider the competition Carey faced — he ran for 206 yards against No. 10 Oregon, 157 vs. No. 16 Arizona State and 149 against No. 17 UCLA — and that he had four more 100-yard games than Williams this year (and did it one less game), Carey was severely underrated despite his All-American accolades. He has yet to announce whether he’ll return to Tuscon for another season. If he does, Carey, who ran for over 3,800 yards the last two years, won’t be fighting for attention. Arizona has struggled all year to defend the rush, coming into Shreveport ranked 71st in the nation (169.8 yards per game), having given up 161 to Washington’s Bishop Sankey. The bruising Williams looked to be a major matchup problem for a Arizona defense that runs a 3-3-5 scheme that utilizes speed and athleticism and can into trouble is against power-running teams. But the Wildcats barely let Williams past the first level, with just one of his carries going over five carries and he didn’t hit the end zone until early in the fourth quarter on a four-yard run. Williams’ 2.9 yards per carry were tied for his second-worst of the season, tying him with his Oct. 12 effort vs. Clemson and was just ahead of the 2.2 ypg he had against USC. Bottling up Williams completely took the Eagles out of their game plan, limiting QB Chase Rettig’s effectiveness on the play-action pass and forcing a ball-control team to try and play catchup as they trailed 21-6 at halftime. Rettig went 16 of 26 for 191 yards and two interceptions, the second of which William Parks returned 69 yards for a TD. With his 10-time Gold Glove-winning father taking pictures from the end zone, Trey Griffey made his mark with the first touchdowns of his Arizona career. Griffey hauled in a 26-yard TD reception via B.J. Denker in the second quarter and a 3-yarder in the fourth quarter. The first of Griffey’s score was an impressive leaping grab to put the Wildcats up 21-6 a, while the second came directly in front of is father, Ken Jr. It continued a breakout performance from the younger Griffey, who didn’t have a reception in the fist nine games, but had 11 in the past three games. He finished Tuesday’s win with three catches for 41 yards, but it was his dad that owned Twitter and offered a reminder that with The Kid now 44, those who grew up with him are now old. With new coach Steve Addazio came some major changes offensively at Boston College. A team that was 45th in passing in ’12 dipped to 113th this season as the Eagles’ philosophy largely centered around riding Williams, with Amidon resigned to blocking more than route-running. A first-team all-ACC selection after catching 78 balls for 1,210 yards — both Eagles records — Amidon’s numbers dipped as a senior. Amidon needed a 10-catch, 129-yard performance just to get close to what he did last season, finishing with 77 receptions for 1,032 yards. But despite a slight step back this season Amidon did leave Shreveport having made history. His 34-yard reception in the fourth quarter gave him 191 career catches, passing Pete Mitchell for the Boston College record.